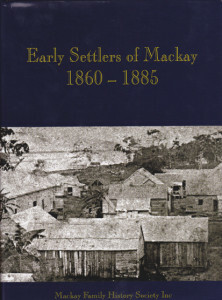 The publication, Early Settlers of Mackay 1860-1885, features 250 pioneering families and tells how they shaped the region. The Early Settlers of Mackay book can be purchased for the reduced price of $60 plus $14 postage to anywhere in Australia. Contact the MFHS to purchase your copy now or for further information. The Library has moved premises to the 1st floor of the old Town Hall, 63 Sydney Street, Mackay. Our sincere thanks to Mackay Regional Council and Mayor Greg Williamson for the efforts in helping us find these wonderful new premises. The Heritage Listed building has the ambience of yesteryear while allowing comfortable researching in our unbearable summer months, thanks to the installation of air-conditioning. There’s a wheelchair accessible ramp at the rear of the building leading to a lift up to the 1st floor. Come along and check us out. You won’t be disappointed.